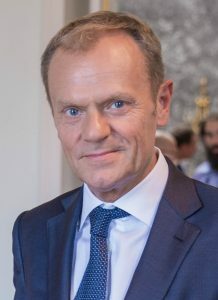 Donald Tusk has been President of the European Council since 2014. The former Polish PM was re-elected by fellow Eurocrats in 2017 with only one EU nation objecting to this re-appointment – Poland. Cue sniggers all round. And lest anyone think this was a verbal stumble, Tusk then tweeted the same comment for the avoidance of doubt. Mr Tusk believes that millions of Brits who enthusiastically promoted the UK leaving the EU deserve to go to hell. Leaving aside Verhofstadt’s theological confusion over Lucifer is, the intent was clear. This pair were trolling pro-Brexit Britain with a “Go to Hell” meme. And it did not end yesterday. As Theresa May went-a-begging in Brussels today Verhofstadt kept tweeting…. One of the reasons the UK voted to Leave the EU was a widespread feeling that those who run it view us with contempt. Tusk and Verhofstadt have ably demonstrated this with these outrageous comments. The sniggering Irish PM Varadkar also showed the scale of contempt our United Kingdom holds for these EU thugs. It shows we WERE right to VOTE to leave this gangster empire. It reinforces the view we are right to want nothing to do with Tusk and Verhofsdat. When we leave, and hopefully take our £39bn with us, hell will be a place on Earth – a bankrupt Islamifying EU. An EU where the people are the enemy of the elite and where violence will be deployed to keep them down. We already see this in French cities and towns. The EU empire will be consumed by the flames of arrogance and corruption of those who sit on their little thrones in Brussels sniggering at the UK. If you want to find hell, look into the black and beating heart of the EU. When we leave we plunge a dagger into it.